When it comes to revamping your website to help it perform well in the search results, the first thing you need to look at is content. Content can make or break a site and tells Google everything they need to know about what you have to offer. As a result, quality content is paramount. Defining quality requires an in-depth analysis of what your target market need and want from you. Not only does your content need to be well-written, it needs to be informative, engaging and easily digestible. In other words, your site content needs to become great linkbait. People should naturally want to link to it and share it within their niche. However, there is no need to start from scratch. Many sites have a lot of evergreen content that can be re-purposed or update to become truly great content. Locate Reusable Content – The first thing you need to do is locate content that has the potential to be reused following a few tweaks. Look for evergreen content that isn’t time specific and modernize it. Collect old blog posts that are no longer relevant and put a new spin on those outdated ideas you once promoted. You may even have a collection of content that is no longer live online. If you wrote guest posts that are no longer being cached, you can simply update them and make them relevant to the here and now. Re-purposing Content – Re-purpose your content to make it suitable for your current business climate and prospective customers. Industries change and evolve so it is likely that much of your recycled content needs to evolve too. Ensure the format is digestible and enticing. Break up chunky text with bullet points and use language that is appropriate for your target market. Add Media Rich Content – When it comes to recycling your old content, chances are it won’t be up to standard with today’s media rich websites. Take recyclable copy and turn it into something new, whether that is visually enticing infographics, video tutorials or podcasts. In today’s online society, no one wants to spend hours reading lengthy copy. People want their information quickly, concisely and in a digestible fashion. Give your target market a range of ways to engage with your content. Make it Linkable – When you are recycling your content, ensure that it is both link-worthy and linkable. Take worn out, out-dated copy and make it original to your brand. Say something new and become the leading authority within your niche by continuously updating tired content in line with industry happenings. Utilize visual aids including educational infographics that people will want to link to. 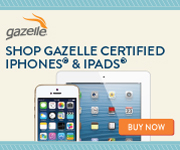 Additionally, make it shareable by including social share buttons next to your on-site content assets. 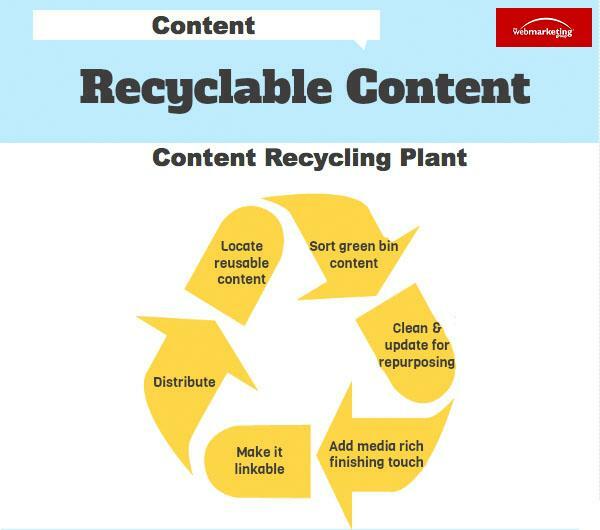 Distribute Content – Think about how you distribute your recycled content. If you previously just put your content on your blog, post about it through social media channels. If you have recycled some of your copy into enticing infographics, distribute them on infographics websites. Videos can be uploaded to YouTube to help increase the chances of your new high quality content being found. Author: Kira writes for Ingenuity Digital, an internet marketing company that specializes in driving high quality traffic to sites naturally. Using in-house journalists and SEO marketing professionals, they aim to maximize conversions through quality content and distribution. To find out more, you can find their latest news and advice on Twitter: @IngenuityDigi.